Many of us share our lives and our homes with more than one pet. There are many factors that determine the kind of relationship your pets will develop. Some factors we have control over – others we don’t. Hopefully you have kept personality combinations in mind when you chose your new pet. Then if you are lucky both pets have had positive experiences with other animals. It is best to observe a few simple guidelines and exercise patience. Careful observation by experienced, comfortable pet handlers is extremely important. Watching each pet’s body language and reacting appropriately can help to avoid conflicts BEFORE they occur. A good time for the first meeting is when both pets are relaxed. Try to keep the initial introduction short – allow time for investigation without aggression or anxiety. Handlers should stay relaxed and use a friendly voice. Positive reinforcement should be used to encourage desired behavior (verbal praise, petting). Tell both pets “it’s okay”. Do not use this term if either pet is misbehaving as this reinforces negative behavior. If you have multiple pets at home – try introducing them to the new kid on the block one at a time. This will help avoid a ” mob mentality”. No matter what the number or combination of species, there are likely to be growls or hisses during the first meeting. It is a rare first meeting that results in immediate friendship. 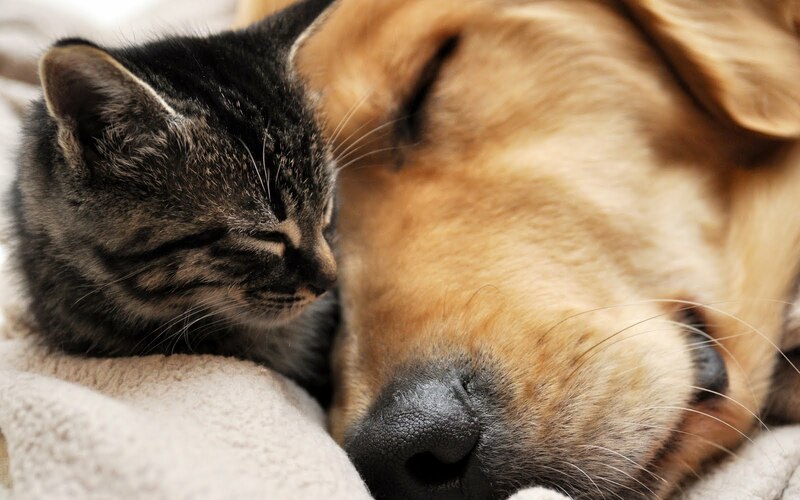 Generally, with time most pets either develop a close relationship or simply decide to tolerate one another. Unfortunately, some pets never accept one another. In these cases, alternative placement should be considered. When introducing two dogs, they should meet on neutral territory – avoid your home or territory your resident dog considers as his. Both pets should be on leads and under good control. The dogs should be allowed to sniff and explore for a short period and then rewarded for their friendly behavior. If you are introducing a cat and a dog, again the dog should be on a lead and under control. The cat should have an easy escape route. If you are introducing two cats both should have trimmed nails. They should either be on harnesses far apart in the same room or they can be started in different rooms to investigate one another through a door. Both pets should have their own secure space with all the necessities. The resident pet should have the more desirable space initially. By the same token, you should greet and feed your resident pet first then your newcomer. They can work out the social hierarchy later on if they so choose. Set aside time everyday for individual attention. This will reassure your first pet and establish a bond with your new friend. Remember to progress slowly each pet meeting. At mealtime, feed pet at a distance at which they will eat comfortably – decrease this distance slowly each day. Be sure neither can get at the other’s dishes!! Pets should be restrained during meetings until they are showing consistently good behavior. This may take several days to weeks and should be with supervision. Have a noisemaker or water bottle on hand. If a conflict arises use these to break it up – NOT your hands. If you any concerns regarding the integration of your new pet into the family consult your veterinarian or animal behavior specialist. They are a great source for information. As well medication is sometimes indicated to help pets over the initial hump. Remember to stay relaxed, cautious and patient and have fun with your fuzzy friends.